At some point in the recent past, the term “global warming” morphed almost imperceptibly into the less alarming and certainly less inflammatory term – climate change. In the sports world that would be tantamount to a rules change and changes of rules normally have a significant influence on the nature of the game itself. And then just as the global warming deniers as the “warmers” call people like myself (Personally, I prefer to be identified as a global warming skeptic.) began to warm (no pun intended) to the new term, the “warmers” abruptly changed the rules once again and refer to the now scientifically challenged global warming phenomenon as – Global Climate Disruption. The changes provoke reasonable questions such as: what is the significance of the name changes and what were the motivations for making them? The following is an attempt to provide cogent answers to those questions. The original problem identified as global warming, i.e. an increase in the temperature of the earth’s atmosphere, was raised in the early 20th century and achieved worldwide notoriety in the second half of the century around the time that the then compelling global cooling scare was losing steam. The warming phenomenon was attributed to the increased concentration in the atmosphere of carbon dioxide (CO2) and other greenhouse gases that tend to trap heat within the atmosphere; they are produced by the burning of fossil fuels, namely oil, natural gas, and coal. It is fact that a small increase of global temperatures during much of the second half of the 20th century is correlated with a contemporaneous increase in the concentration of atmospheric CO2. 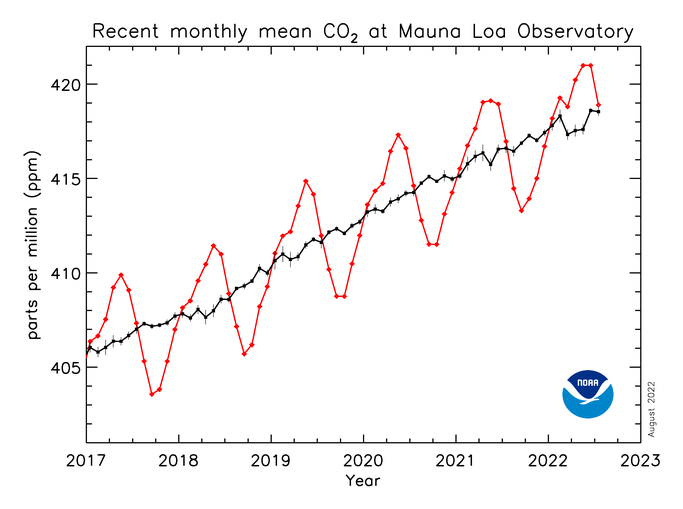 The conclusion drawn from the CO2/temperature correlation by the “warmers” is that the increased temperature is a direct result of increased CO2 concentration. Since man apparently is the primary contributor of CO2 man must be responsible for the global heat rise notwithstanding the fact that correlation does not necessarily establish a cause-effect relationship. If the effect – temperature increase – was the unequivocal result of the singular cause – increased concentration of CO2 - then the atmospheric temperature curve should continuously track the CO2 curve which shows a steady and continuous increase with time for the past 100 years or so. But it doesn’t! For the last decade and one-half the global atmospheric temperature has leveled off – it has shown no perceptible increase during that time period even while the concentration of CO2 has continued to rise at a more or less steady rate. How then can the “warmers” trumpet global warming when there is none? Obviously they can’t so to maintain a semblance of credibility that would allow them to advance their ideological goals, an element of which is to frighten the general population of a coming climate catastrophe (the ultimate weapon of mass destruction as one former politician called it), a rules change that would again redefine the game became necessary. Thus global warming morphed to climate change, a highly complex subject that incorporates, among other natural processes, atmospheric temperature changes, both warming and cooling. The change from a narrowly focused idea – global warming – to one with a broader scientific foundation – climate change – presumably was designed, at least in part, to reconcile inconsistencies in the “warmer’s” arguments, namely the failure of atmospheric temperatures to correlate with CO2 increases during the past 15 years and questions raised by skeptical scientists concerning the ability of existing large-scale climate models to accurately predict future climates 20-100 years into the future. The change may also have been an attempt to reduce some of the ridicule that was occasioned by episodes of unusually cold weather in various locations on the planet (In North America, the winter of 2013-14 is a notable example). But as all serious scientists know, the climate is inherently variable and has responded to natural forces on time scales ranging from a few hundreds of years to several millions of years. An example of the former is the little ice age that occurred between the 16th and 19th centuries while the classic example of the latter is the great Pleistocene Ice Age, the latest stage of which ended about 12,000 years before the present (BP). A climate change event of intermediate duration is represented by the Altithermal period that occurred some 8,000 to 5,000 BP; it was characterized by temperatures higher than they were before the onset of the Altithermal and higher than they are today. In other words the Altithermal was a period of global warming. And none of those earlier changes were associated directly with the activities of mankind rather they were events forced by natural factors that because of their complexities may or may not be well understood, i.e. the science is not settled. And since the “warmers” are predisposed to unnatural changes, and climate change connotes a natural cause, another rule change was needed. So to minimize the effects of nature and maximize the effects of man, climate change had to morph, and the new term was Global Climate Disruption (GCD). One of the precepts of GCD is that the greenhouse gas emitting activities of humans is causing increasing occurrences of more extreme climate events, hurricanes and tornados in particular, and more natural disasters, floods, droughts, wildfires, etc. That, however, has proven not to be the case. In a recent article in the Washington Post, the noted author and columnist, Dr. Charles Krauthammer cited government reports that show a decline in extreme climatic activity in North America during the past three decades. Specifically, records for the year 2013 show the occurrence of the fewest number of Atlantic hurricanes in the past 31 years. Additionally, extreme tornadic activity has shown a 30 percent decrease in the U.S. in the past 30 years. The present drought in California has been attributed to climate warming however the models that purport to predict future atmospheric warming imply the opposite would happen, that is precipitation during the winter rainy season should increase and not decrease which contradicts the reality of the present drought there. Climate experts generally discount atmospheric warming as the cause of the California drought. And the wildfire problem seems to be more related to land use patterns and wildland management practices than to any changes in the climate. So, the “warmer’s arguments that man’s activities are disrupting the climate in a negative sense, i.e. there are more hurricanes and tornados then there were in past years, are refuted by the records and observations of climate experts. The available evidence and sound scientific reasoning also fails to establish a clear cause-effect relationship between man’s activities and climate disruptions as the “warmers” assert. So in answer to the questions posed above, the changes in the terms used by the “warmers” to describe what they perceive as a man-forced climate anomaly appear to be of little real significance. All appear to imply that any time or space scale climate perturbations are the responsibility of man, specifically his exploitation of fossil fuels. The many other natural factors that could contribute to the perceived anomaly are never considered even though the term climate change implies the existence and perhaps even the dominance of such factors. So the rules change but the game remains essentially the same – blame the man – no matter what the record shows! The motivation for the changes seems to be an attempt by the “warmers” to cloud their failure to establish unequivocally using sound science man’s accountability for any and all climate changes and – perhaps – to reinforce their unshakable belief in consensus science – a concept that leads directly to their faulty assertion that the debate is over.